Having your own pool can be one of the most enjoyable experiences known to any homeowner. But, keeping your pool in tip-top shape year round can be a daunting task if you do not know what to do. This can be especially true for those who own pools in colder climates such as Maryland, Virginia, or DC. Here are 5 tips to help you better understand the more important swimming pool maintenance tasks. Total alkalinity refers to the level of alkaline that is in the water. It is often abbreviated as TA. Water that has a high alkaline level will have a high pH level. Pools with a low alkaline level will have a low pH. Generally, you want an alkalinity level reading of 100 parts per million (ppm). The pH level in your pool can affect your swimming pool equipment and many of the finishes that are found in pools (chrome on ladders, scale on tile, etc). 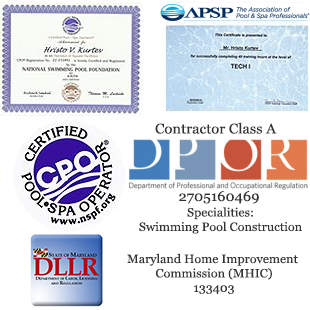 Fresh water pools need to maintain a pH level that is between 7.4 to 7.6. Here is a tip that everyone needs to know. Having the proper amount of calcium in the water is essential to good pool health. When the calcium level is low, you run the risk of eroding the plaster (if your pool has plaster walls or floor). If there is an excess of calcium, the water is likely to become cloudy. You want between 200 and 400 ppm, with 300 ppm being the ideal amount of calcium hardness. One of the most common causes for scale buildup on swimming pool tile is incorrect pH levels. When the pH is not correct, calcium carbonate begins to leach out of the water and will “stick” to your tiles. This often appears as gray or white patches which can be hard to remove. Keeping the pool water balanced (see above) will prevent this from happening. If you are having problems with scaling, test the calcium hardness level. Try maintaining a level of 200 and 235 ppm. Remember, the higher the hardness, the more likely you will have scaling problems. You can use what is known as a scale inhibitor to resolve this problem. The following applies to those who live in moderately cold areas. For details on how to close your pool in very cold areas see the instructions below. Begin by checking all of your chemical levels, especially acidity levels and pH. Your water should be balanced before cold weather hits. If there is a risk of freezing temperatures, you need to drain your pool pump and the filter. Use the drain cap (or plug) to perform these tasks. In areas where it may or may not freeze, it is better to not take chances. With that said, drain the pool so that the water level is about 5 to 6 inches before the level of the skimmers. If you live in warmer climates, you do not have to do this step. Clean your pool before you cover it. The cover should be placed over the pool so that it is tight and thoroughly secured against wind. If you live in DC, Maryland, or Virginia, you already know how brutal cold weather can be on swimming pools (and everything else that is exposed to the elements). The following will help you protect your swimming pool during the cold season. You must bring your water chemistry to the proper levels: pH between 7.6 and 7.8; alkalinity between 80 and 100, calcium hardness between 200 and 400. You should shock the water using a quality chlorine shock to get to a level of 10 to 12 ppm. Make sure you let the chlorine level fall to 1.5 to 3.5 ppm before adding pool algaecides, winterizing chemicals, or the pool’s cover. Remove the attachments (heaters, ladders, etc) and the skimmer baskets and store. Clean the pool and add a good quality winter pool water conditioner. This will help to keep the chemicals in balance. Backwash your filter and when finished drain the pool so the water level is about 4 inches below the lowest water plumbing line (this is usually the water return line. The water level must be below the skimmer level. Drain the pool pump, as well as the filter, and any pool heaters or chlorinating equipment that you may have. These usually have a drain plug for this purpose. To not forget this step! Frozen water left in these can cause them to rupture. It is best to keep the plugs out; store them where you can find them later. If you use a chemical feeder, now is the time to empty it. At this point, you can cover your pool; follow the cover instructions and make sure you have a tight, secure fit. Remove the cover and put it out to dry in the sunlight. Never fold up a wet cover as this can cause mold and mildew to develop. Make sure you have all of the chemicals and supplies you need before you begin the next steps. Inspect all of the pool and its water lines, pump, and filter for any damage. Replace the drain plugs, any attachments that you removed (ladders and such), replace the skimmer baskets, and fill the pool to its proper level. This is also a good time to check the sand level in the filter or check the filter cartridge. Turn on the filter and let it operate for about 24 hours. Do this before you add any new chemicals. Once this is completed, test the water for balance and add the chemicals that are needed. Make sure the pool is chemically balanced and has the right amount of chlorine before allowing anyone to swim in it.